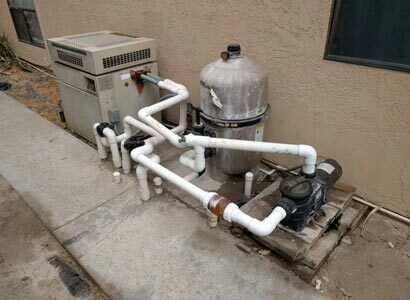 When contacted by this homeowner in Santee, CA, they were wanting to upgrade the pool equipment. This was due to the pool equipment was old, leaking, and not working. When doing a visual inspection of the equipment, we could see many issues. The pool pump was leaking along with the pool filter. Their existing pool heater was not heating or turning on as it was very old and due to be replaced. As new pool owners, they were anxious to get the new pool equipment upgrade so they could start using the pool and spa. With the existing pool equipment condition, they may have been able to swim but not use their hot tub. Because they were already replacing the pool equipment, they decide to add a new saltwater chlorine generator. There was also an added benefit by upgrading their pool equipment in Santee. This would allow us to replumb the entire equipment area making things look and operate much better. Below, we will go over the Santee pool equipment upgrades that were made and why. We always provide our recommendations so that the pool owner can make the best decision on the pool equipment upgrades they are interested in. Older pool heaters will often times stop heating up to temp or stop heating altogether. 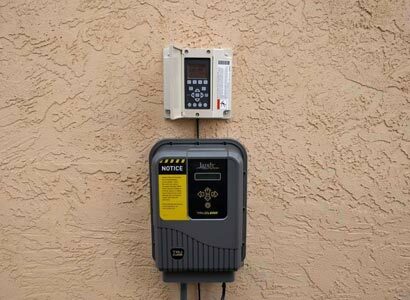 They will also encounter electrical and electronic issues depending on the type of pool heater that is not working. Whenever able, we will always look to perform a pool heater repair but this pool heater was not worth repairing. This old non-functional pool heater was a Teledyne Lars pool heater. This pool heater in Santee lived a long life to have made it this far. Most pool heaters at this age would have been replaced many years ago. When performing this pool heater upgrade, we installed a Raypak pool heater. These pool heaters are one of the best pool heaters you could have in Santee or any other part of San Diego. They are atmospheric heaters that do not require a blower to vent the heat chamber. The Raypak pool heater installed has not changed very much over many decades and works very well in the field. Raypak pool heaters are very durable, and reliable pool heaters that hold up over time. We often recommend installing a Raypak pool heater unless there are space limitations or the customer is simply requesting a different pool heater. 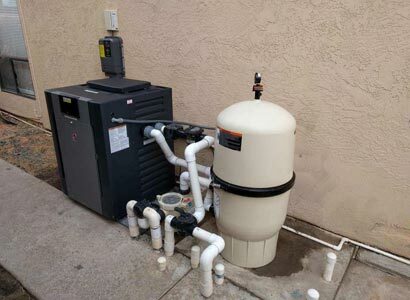 When performing this pool heater upgrade in Santee, there was plenty of extra space to allow for installing the Raypak heater. If taken care of with proper water chemistry and protection from the elements, this pool heater could last twenty years. The average life expectancy of all pool heaters installed is on average ten years. Upgrading the pool pump in Santee started off kind of strange. When we went to remove the old, leaking pool pump, we noticed it was set up on three different concrete pads. That means there were three separate pieces of concrete that the pool pump was set up on. It looks as if they did this so that the pool plumbing lined up. That would be done if the pool pump installer was not very adept at using various PVC fittings to install correctly. When we removed the old pool pump, we also removed the old concrete beneath the pump. We then professionally installed the new variable speed pool pump at the correct level while also making the area look cleaner. The old pool pump that we upgraded in Santee was also not in the ideal location. This is why we moved it in between the pool filter and the pool heater. This will allow the pool equipment area to be a smaller footprint and for the overall functionality of the swimming pool plumbing. 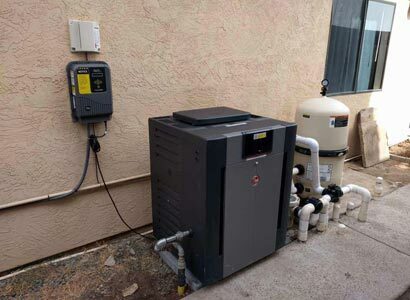 By upgrading the pool pump to a variable speed, energy efficient pump, they will save money. Pentair variable speed pool pumps are much more efficient and will run quieter and provide many years of operation. When recommending a pool pump upgrade, we always start with the Pentair pool pump. This pool pump also allowed us to install the pool pump remote in an area that was much easier to access. When looking at the old pool filter, we could notice issues. There were signs of existing and older leaks along with the pool filter was breaking down. When upgrading your pool filter, we always recommend installing a cartridge pool filter over a D.E. pool filter. D.E. pool filters use an extra material to coat the internal pool filter grids. This is the D.E. which is very messy and may not be safe when inhaled in its dry form. As with cartridge pool filter upgrades, there is no D.E. This type of pool filter cleans the pool water with the internal cartridges only. And when performing a pool filter clean, you will simply remove and spray clean. With the D.E. pool filters, they are very messy when cleaning and you will need to add the necessary D.E. through a slurry, poured into the pool skimmer. Cartridge pool filters are easier when performing pool filter cleans for either the homeowner or weekly pool service technician. Due to performing a complete pool equipment upgrade the pool owner thought it would be a good time to make it a saltwater swimming pool. Saltwater chlorine systems are a great addition to any pool as long as the water chemistry is properly maintained. This means that the pool water chemistry is tested and adjusted on at least a weekly basis. Performing the weekly pool cleaning will include the need to check and adjust the acid levels to ensure the new saltwater chlorine system works properly and does not damage the pool’s surfaces. Saltwater pool upgrades are a great addition as long as they are taken care of. Saltwater generators will help keep a good, safe level of chlorine in the water while not overdoing it. Salt systems allow you to keep a lower level which makes the pool and spa more enjoyable and ultimately more safe for your family and friends. If you have a saltwater swimming pool in Santee or any other area of San Diego, make sure to keep up on your pool water chemistry. Perform this yourself or hire a professional weekly pool cleaning company. We are a fully licensed and insured pool contractor that specializes in various services to help. We offer complete pool repairs and new pool equipment upgrades along with pool services to help keep your pool clean and safe. If you have any questions regarding upgrading your pool equipment or anything else, please feel free to contact us via phone or our contact form. Everyone we dealt with was very responsive, prompt, and extremely knowledgeable. We were very impressed with the service we received and the installation that was performed. We will definitely recommend Pro Touch pool services to anyone we know who needs pool maintenance. Thank you so much for the great work. We really appreciated the attention to details and the extra care that was taken to not just install new equipment but completely rework the piping and organization of the equipment. Thanks again!